Are You or Someone You Know Suffering from Shingles? Shingles is a viral infection that affects the nerve roots. It causes pain and usually a rash on one side of the body, the rash often forms in a band, strip or small area. Most commonly shingles affects older adults and people with compromised immune systems. Shingles occurs when the viral infection chicken pox is disturbed. Chicken pox is a viral infection that remains dormant in the nerve roots well after the symptoms have cleared. When a person experiences weakening of the immune system caused by disease, stress or aging; the infection awakens in the form of Shingles. There are very limited treatments for shingles; your primary physician may prescribe antiviral medications, pain medications or skin cream. In our office we have had great success with the treatment of shingles using acupuncture! Results vary from patient to patient but we can usually see significant difference in symptoms within the first 6 treatments! Results are much better the earlier we start treatment, so if you or someone you know think you might be suffering from Shingles, please don’t hesitate to give us a call! Interested in a Way to Look Younger Without Surgery? These days image is more important than ever; for a lot of people image may be negatively affected by wrinkles, dark circles around the eyes and sagginess within the skin of the face. There are creams; skin treatments and even surgery to reverse these signs of aging, which involves harmful chemicals, long recovery times and huge price tags. 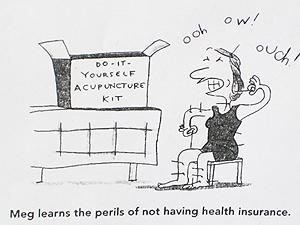 At Carpenter Chiropractic and Wellness Clinic, we offer a safe alternative to all of that – acupuncture. We have had great success with the use of acupuncture to reverse the signs of aging. Of course for every patient results vary but on average it takes under 10 treatments to see results, and then just a couple of appointments every 6 months or so to hold the face lift. This is an affordable, safe way to look and feel better for all those special occasions in one’s life such as weddings, anniversary parties, class reunions or even everyday life! Give the office a call if you have any questions or would like to start treatment!